Ghostrunner on First: C'mon Down to the Great At Bat Giveaway! When I read that sign, I'm shouting it in my head in a monster truck announcer voice. Try it, it's fun. Word to Scott on that comment. Same here. And Drew, this is exactly why this team is so hard to watch at times. Growing up a baseball player without any real power, I knew i had to do two things - don't strike out (give an at bat away) and don't pop up. I've seen so many at-bat given away this season - three to four pitch strikeouts when you know a deuce is coming (out of the zone) with 2 strikes, pop ups on the first pitch. Opposing pitch counts are incredibly low. Lester has been awful this year. Yet the Jays had, what, 1 hit? And 15 times as many K's. If one didn't know better, one might think you were pinning this on the manager. Clarence got his nails did. You see, this is why I hate statistics. Because they keep making me sad. Cito was actually critisizing Overbay the other day for being too patient at the plate. You know, the same Overbay who's led te team in OBP for years, and just got off to his worst start ever as he hacked away at pretty much everything opposing pitchers threw at him? This team was fun to watch for a while but it's pretty obvious that the whole league is aware of their approach... If the bitters do t adjust then we're going to be stuck watching a lineup comprised almost entirely of 1997 Joe Carters striking out while The Manager praises their aggression. That picture makes this post even more amazing. 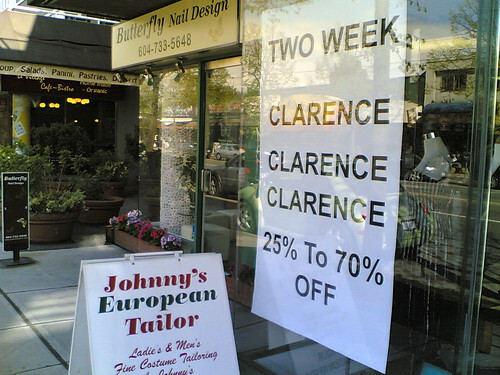 I can't wait until the Clarence sale is over forever this September. That picture is my find of the year. Amazing. Did anybody else notice that when the count is 2-0, or 3-1 there's an unwritten code to take the pitch, even if it is a fastball? Yeah, I don't get why even people who think Clarence is an awful manager are so quick to concede his incredible hitting prowess. "Hey, let's make Adam Lind a one dimensional pull hitter!" I think home runs are the only things that arouse Cito anymore. Swinging for the fences every at bat makes for boring baseball. But it takes the least amount of strategizing, because you know, Cito deserves a break after winning those 2 rings. Took me a while to notice that the sign said Clarence instead of Clearance.